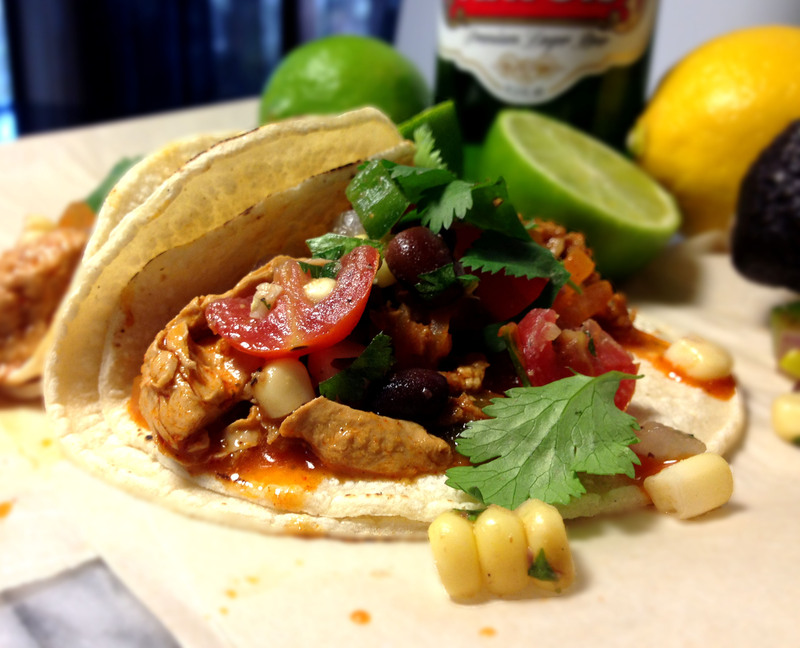 Easy & Spicy Crock Pot Chicken & Chorizo Tacos – Vegan or Not! 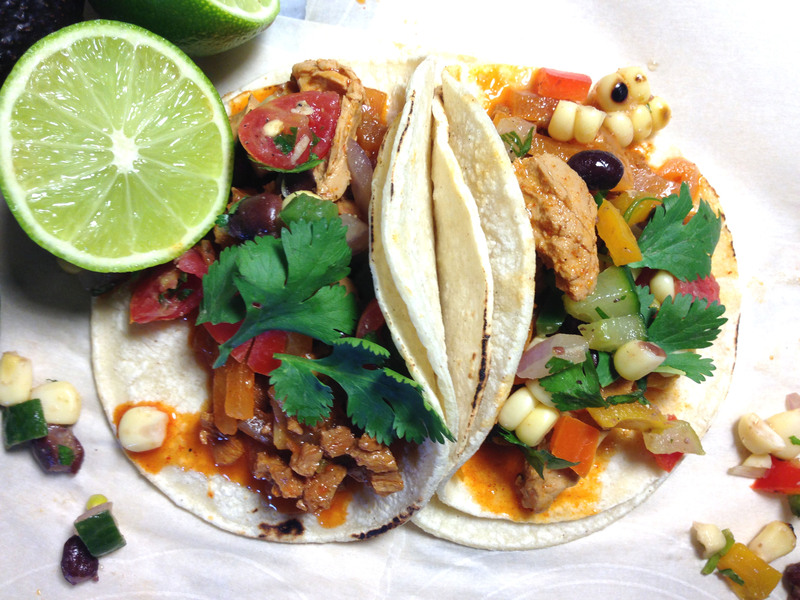 OK – I made these because I had SO MUCH leftover Spicy Grilled Corn & Black Bean Salsa. I always feels sorta bad when I post a recipe that makes an unreasonable quantity of something – like the Hoppin’ John recipe. I feel like I should follow up immediately with alternative ways to use the leftovers. 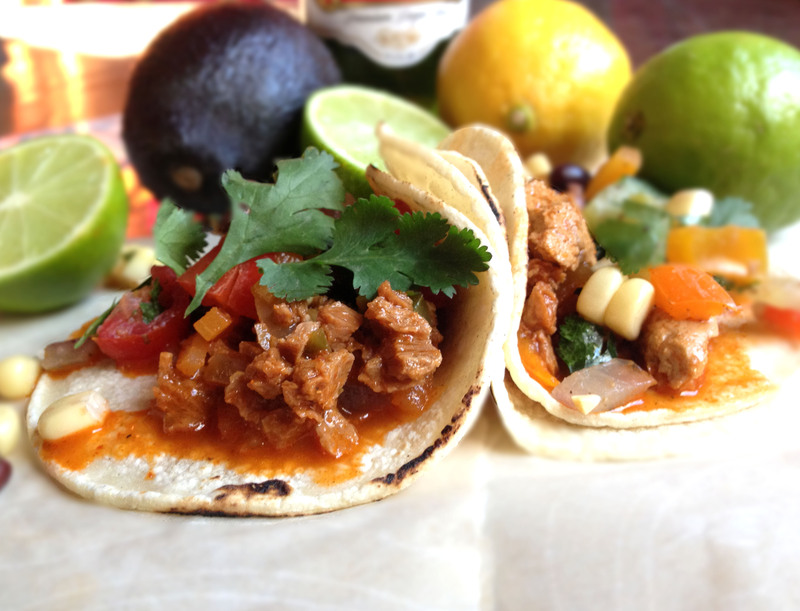 So – I made tacos again yesterday (for the leftover salsa) & holy shite! These bad boys came out incredible! 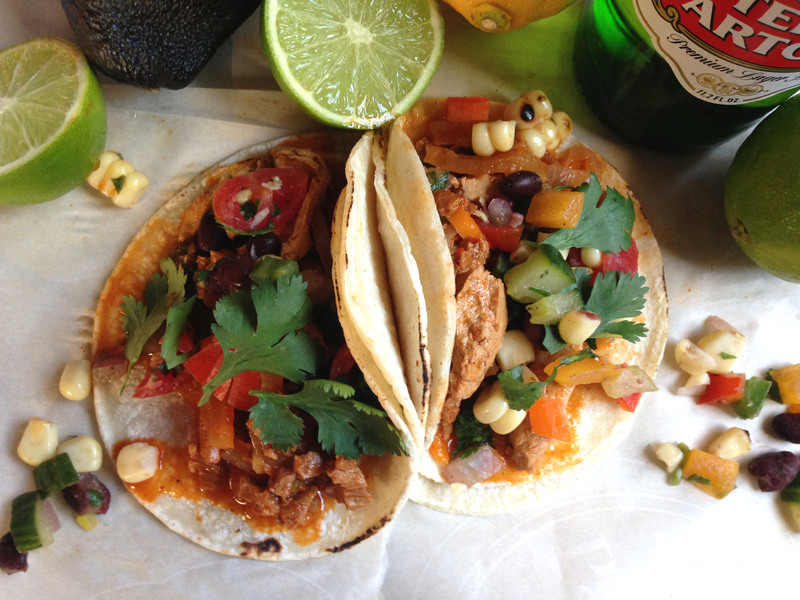 I recommend this taco recipe VERY highly not only because it is delicious but also because it is so damned easy! I made the vegan version but the meat version should be just as simple. 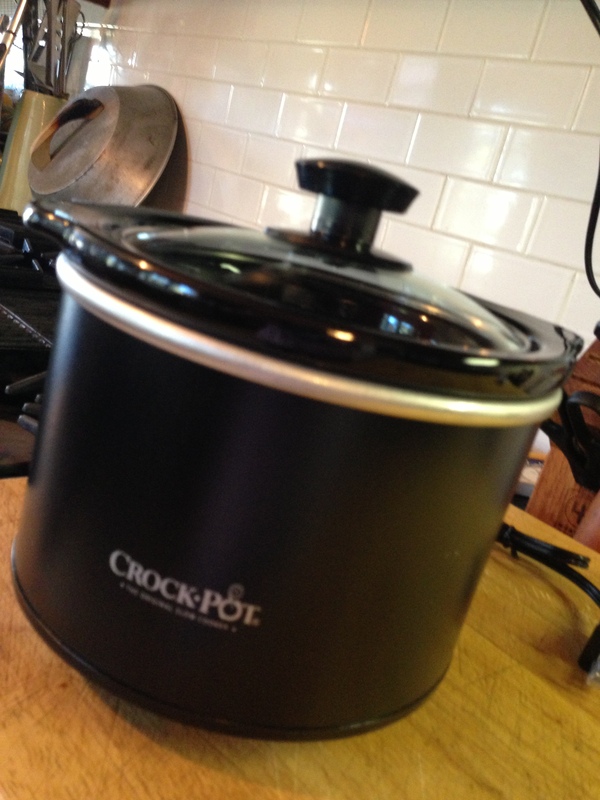 I also used this 1.5 quart Crock Pot (the perfect size for singles or couples who want to make smaller portions of things) that I bought at the supermarket for $11. It is about as wide across the top as my outstretched palm & fingers. No settings. 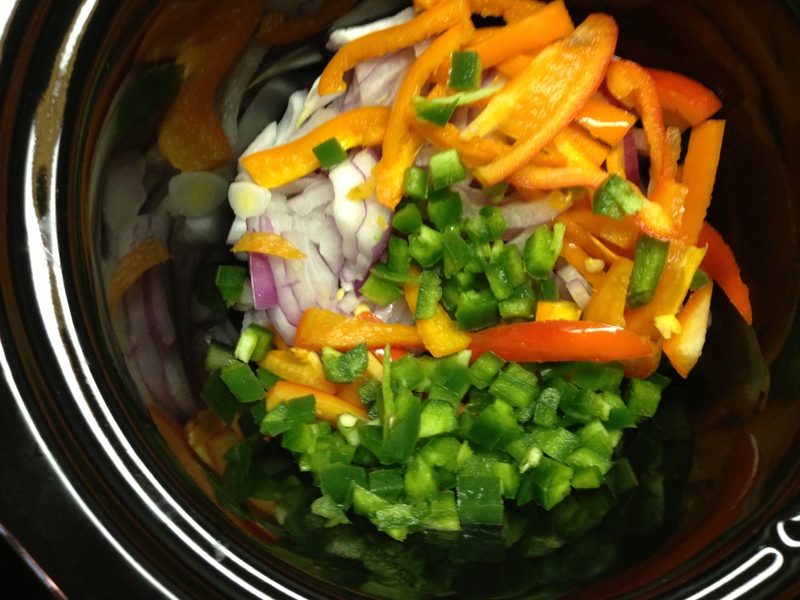 Just a simple & small slow cooker. This made enough of the taco filling to stuff two people & maybe feed four – if there were rice or something served with the tacos. 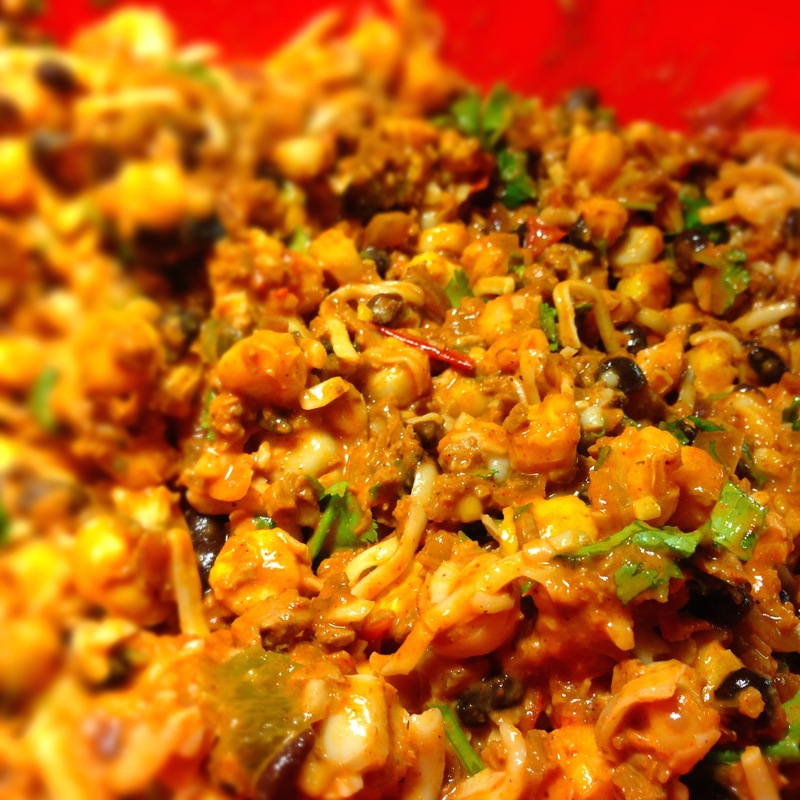 In fact – this chicken/chorizo filling was a lot like a chili & would go very nicely over rice – rather than in tacos. 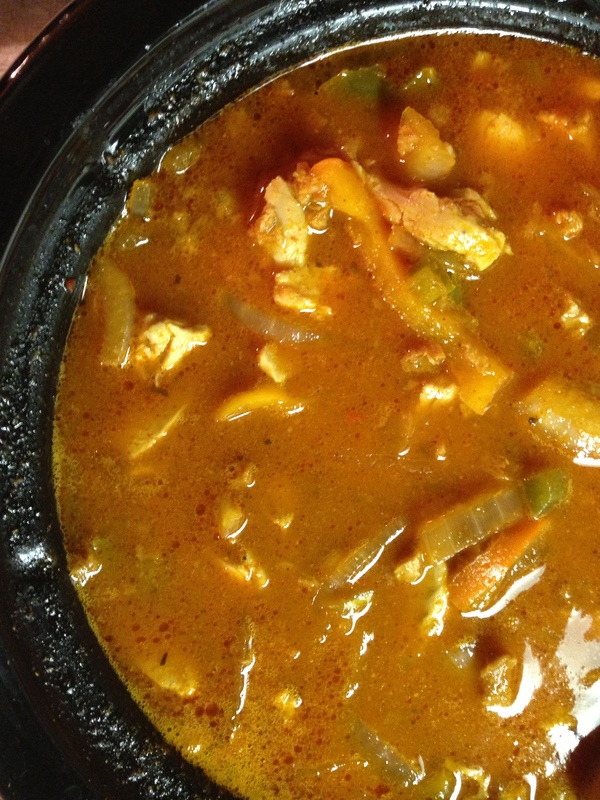 If you do not have a crock pot – this can be done stove top. It will just require that you keep a bit more of an eye on it. The wonderful thing about the crock pot thing is that once I chopped up the ingredients & wiped the cutting board – there was virtually no additional cooking or cleaning – except for the crock pot itself. 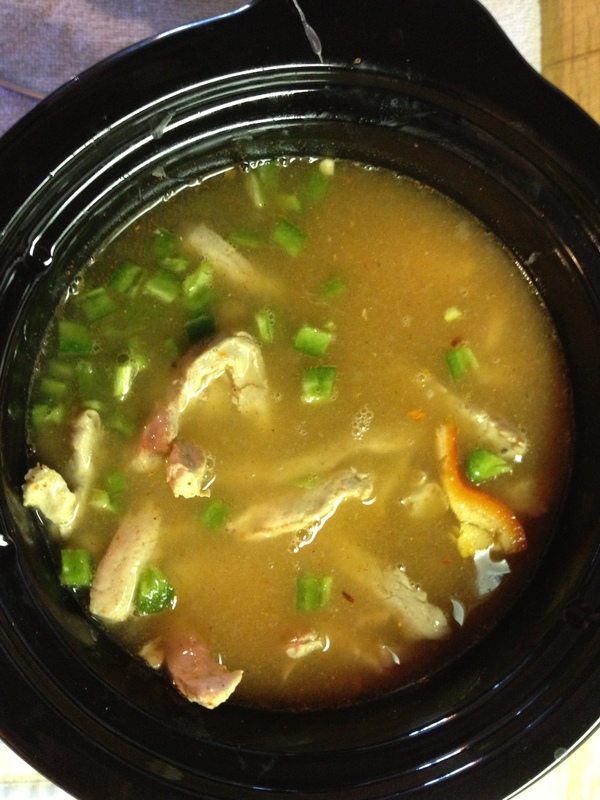 If you are feeding more or have a larger crock pot – double up the recipe. I bet it freezes really well. 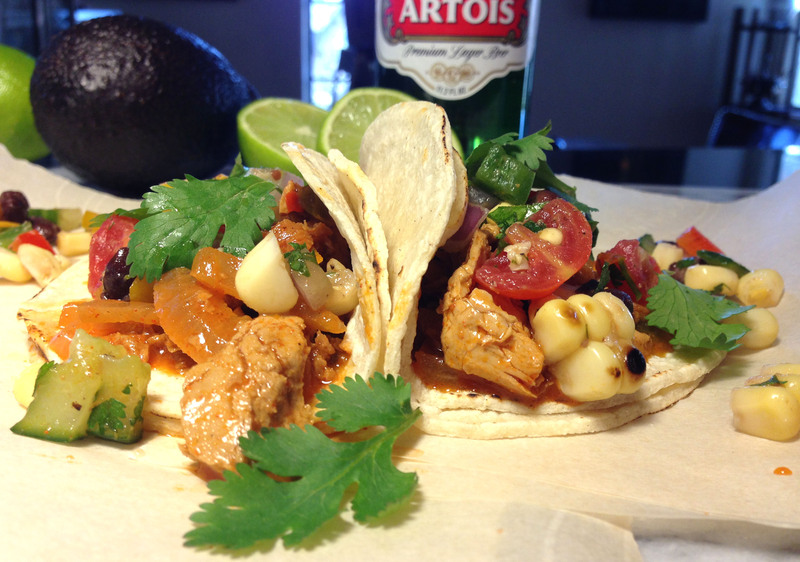 Garnish: cilantro, avocado, lime wedges, queso fresco (for non-vegans) and/or Spicy Grilled Corn & Black Bean Salsa. 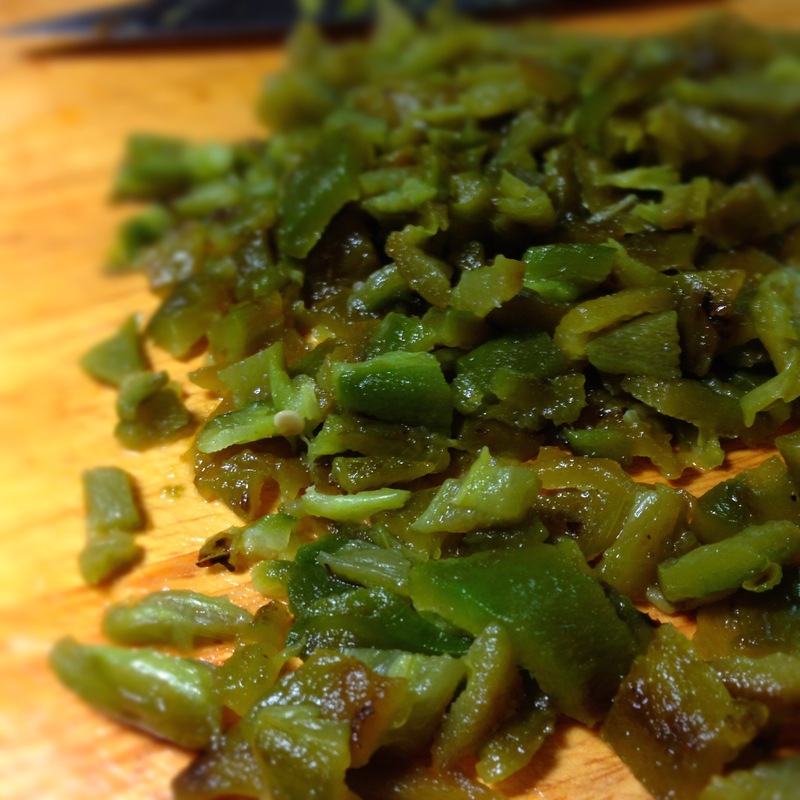 Cut up the veggies (onion, peppers & jalapeno). Put them on the bottom of the crock pot (or in a pan stove top). 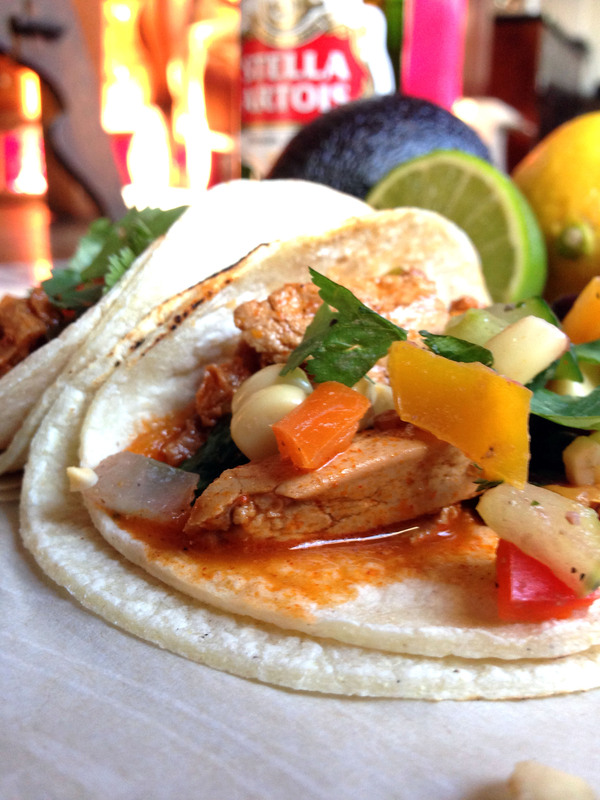 Add the chicken & chorizo (or vegan versions). Add the lime juice, taco seasoning, stock & Italian dressing. This filled my crock pot perfectly to the top. You might need less stock. My little crock pot has no settings – so – I just left in on for 3 hours. 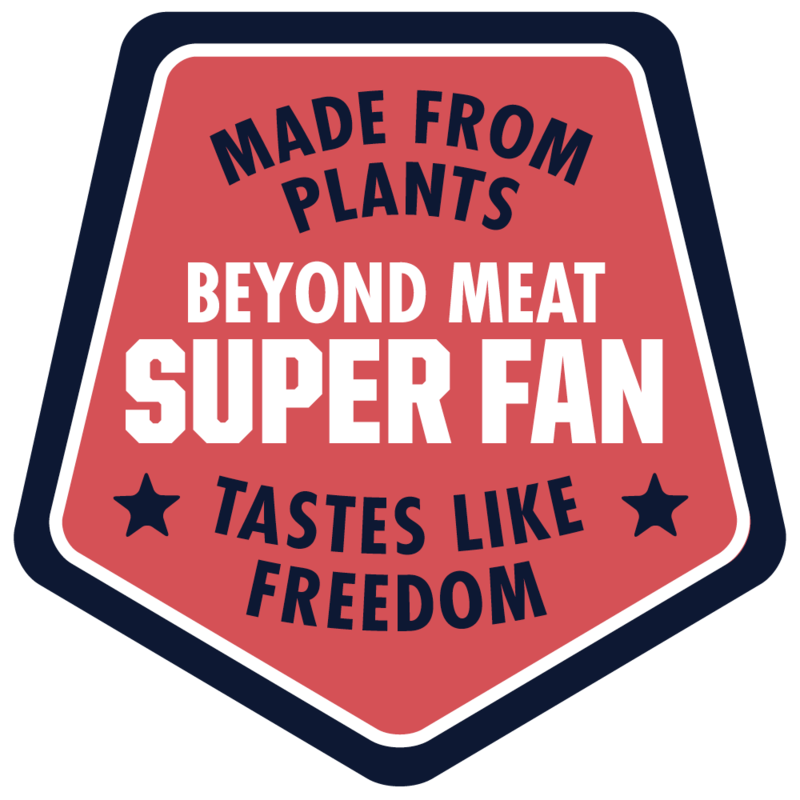 If yours has settings – set it at high – ESPECIALLY if you are using real meat. 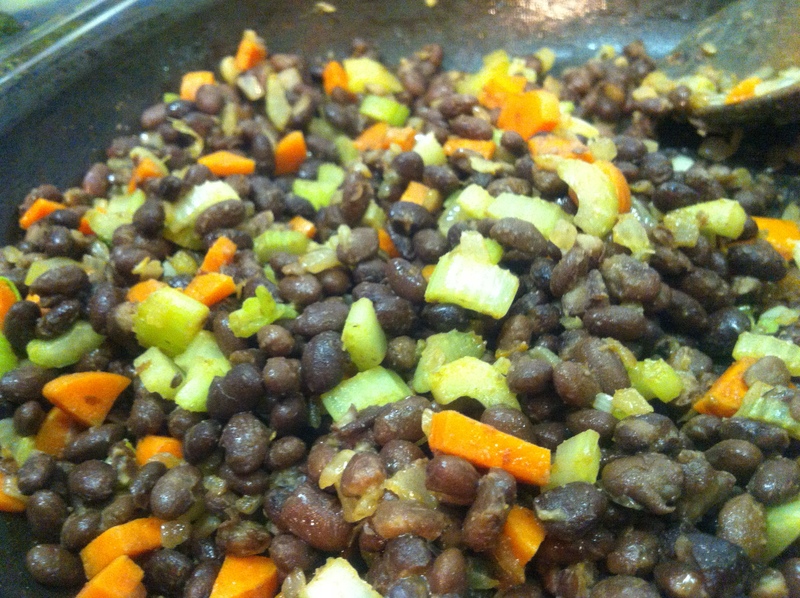 If you are doing this stove top, I’d bring it to a boil & then simmer it for 2-3 hours (or less – if using vegan meats). If using real meat – be VERY sure your chicken is cooked through. The result should be pretty soupy still so use a slotted spoon to serve the mixture onto warmed corn tortillas. Garnish as you will. First of all – these photos are really lame & do not do this dish justice. Part of the problem is that it falls apart on your plate when you serve it & just looks messy. The other part of the problem is that, so often, I am posting my daily meals on here & sometimes, like last night, I am hungry & impatient & not in the mood to walk around my house with a plate of cooling food looking for nice light to shoot it in. I also have a limited number of dishes to present food on & limited places with proper lighting – especially at night – and I am finding that my images are starting to all look alike. Anyway – this doesn’t look very pretty but let me assure you – it is delicious & really easy. I made a hominy mac & cheese on Cinco de Mayo & it was a HUGE hit. I am waiting to post the recipe until I make it again in a more manageable quantity. My May 5th recipe feeds about 40. I will include that recipe, too, when the time comes. This dish was born, like so many of my recipes, of things I already had around. I had tomatoes & jalapenos that needed using. I had left over black beans from the May 5th party. 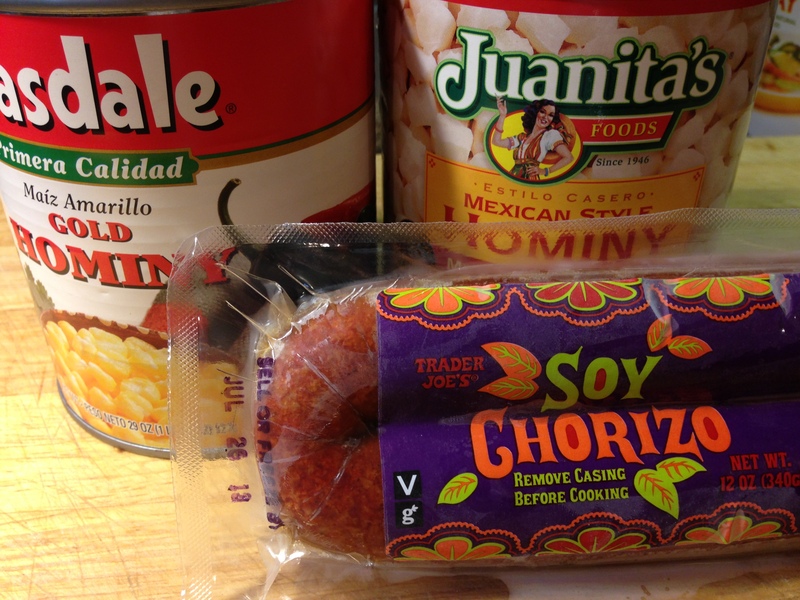 I had several cans of hominy around & I had some Soyrizo (vegetarian chorizo). And – as always – I had tons of cheese. I also had leftover crema (Mexican sour cream) and milk from things I’d made last weekend. The beans I used in this were already heavily seasoned but you could just use canned black beans if you have no prepared beans around or hanging out in the freezer. Hominy refers to corn kernels without their germ and their hull, or bran. The germ and hull might be removed by soaking the corn in a special type of solution or by crushing the kernels and then sifting them out. It can be served whole or ground, and as a cereal or as a vegetable. The ground kernels can also be pressed into patties and fried. 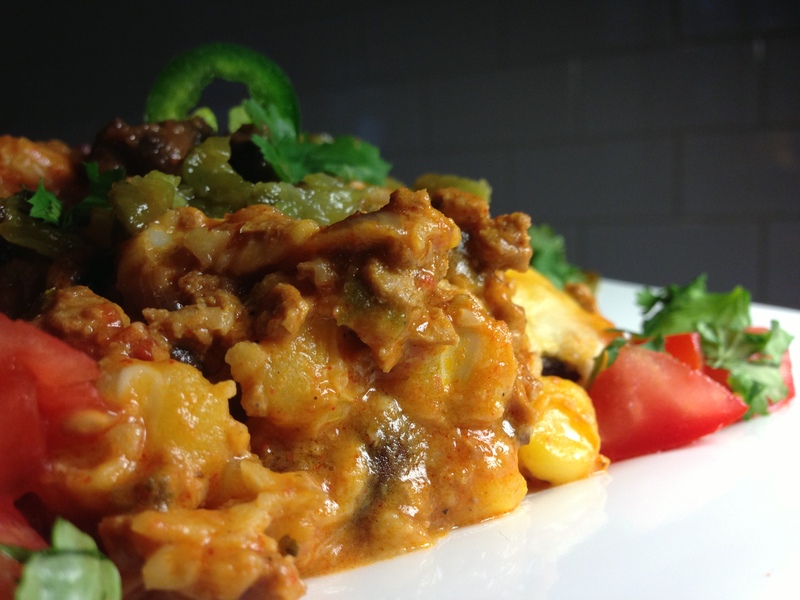 This dish is especially popular in the southern United States. 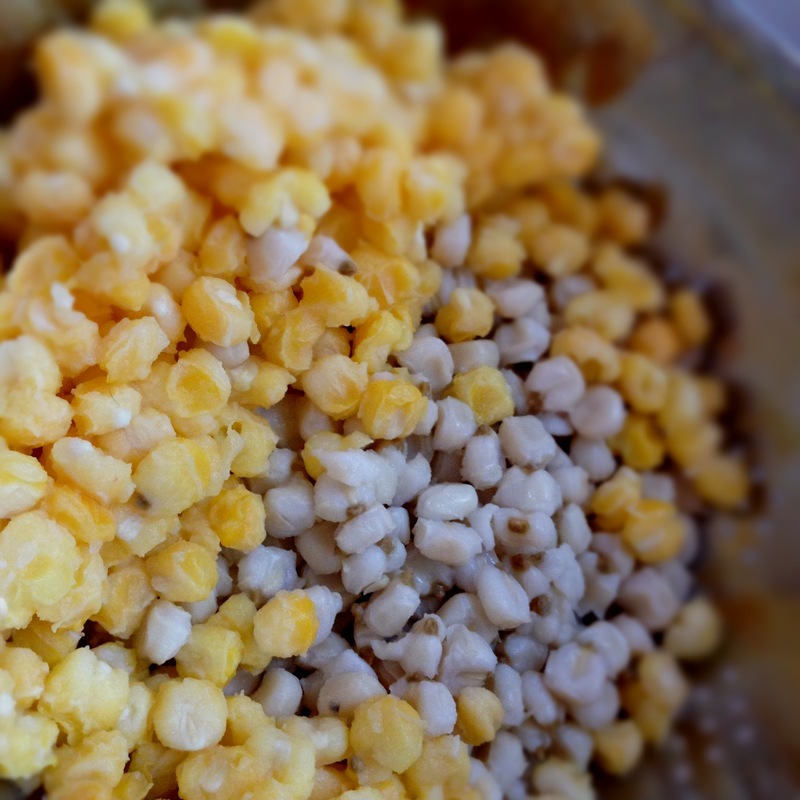 To make hominy, the corn can be soaked in an alkali solution, such as weak lye. This type is sometimes called lye hominy. When the germ and hull are removed mechanically by crushing and sifting, the variety is often referred to as “pearl.” Removing the germ prevents the corn kernels from sprouting while they are being stored. 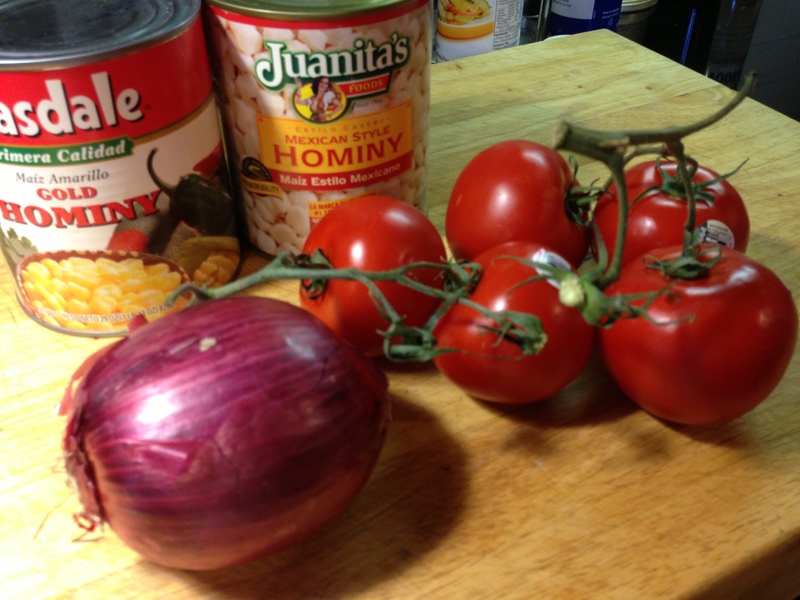 There are many other names for the variations of hominy. It might be called yellow or white, depending on whether it was made with white corn or yellow corn. It’s often called samp when it’s coarsely ground, and when ground into small grains, it’s often called grits, hominy grits, or little hominy. In some places, when the kernels are whole, it is called posole. Hominy has intrigued me from the shelves of my grocery store for years. 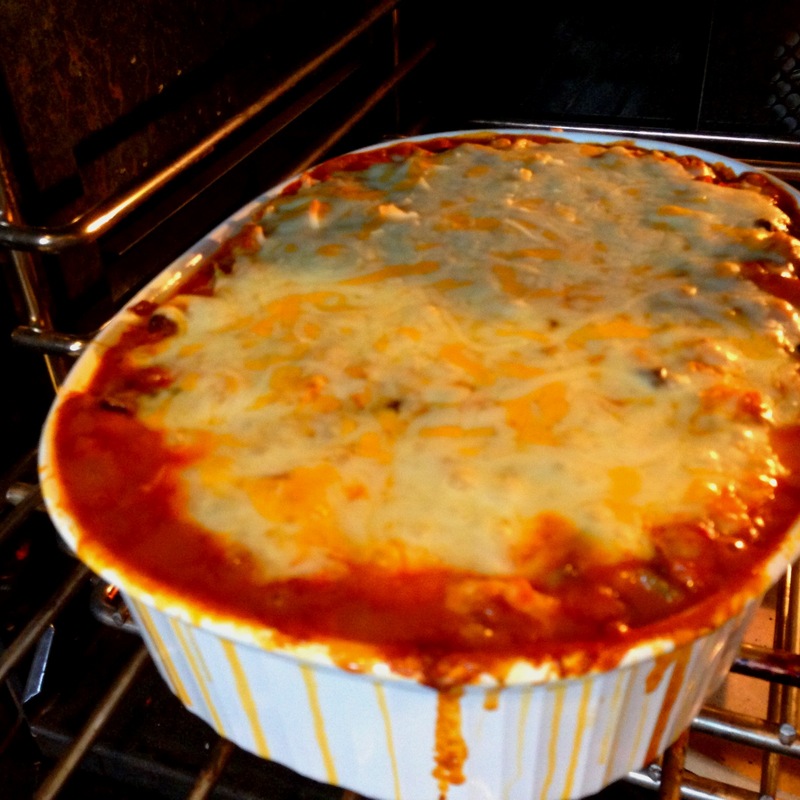 It looks like comfort food & it is inexpensive. Still – it wasn’t until my Hominy Mac & Cheese invention that I ever tried using it. The mac & cheese was so crazy popular that it has built up my confidence that the earthy corn flavor is something lots of folks respond well to. 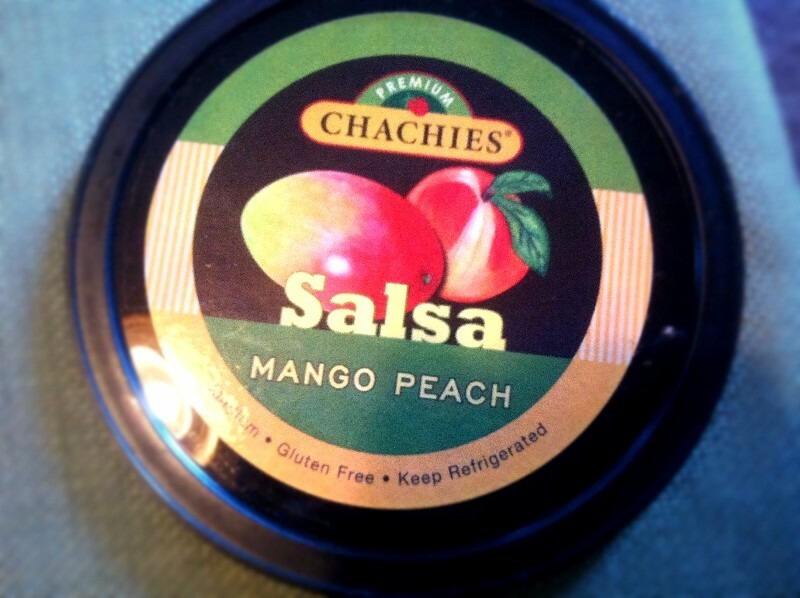 It tastes kind of like a corn tortilla. It has the texture of maybe a grittier garbanzo bean. 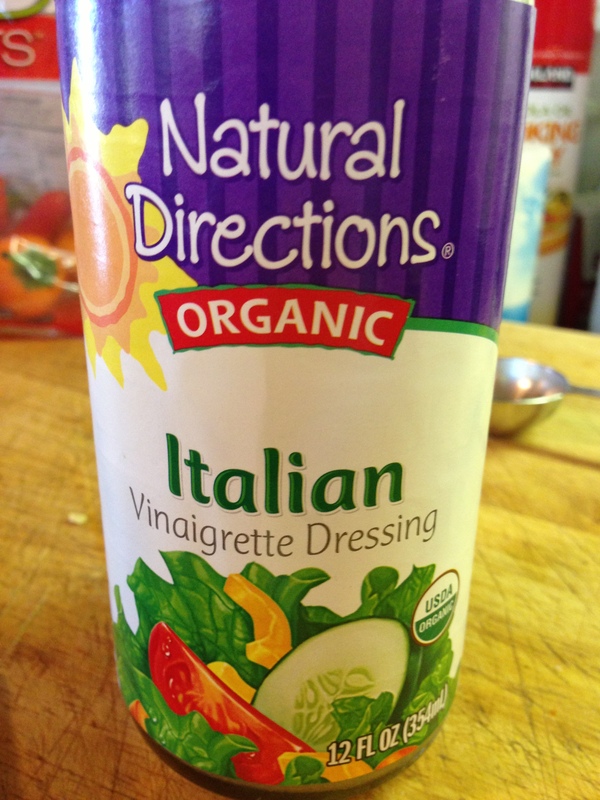 In recipes, it provides flavor & texture & all the comfort of pasta – without being pasta. I think it is gluten free & nearly fat free & only has about 119 calories in a cup. It is a carb but it is also high in fiber. Ground up hominy is another of my favorite things – grits! 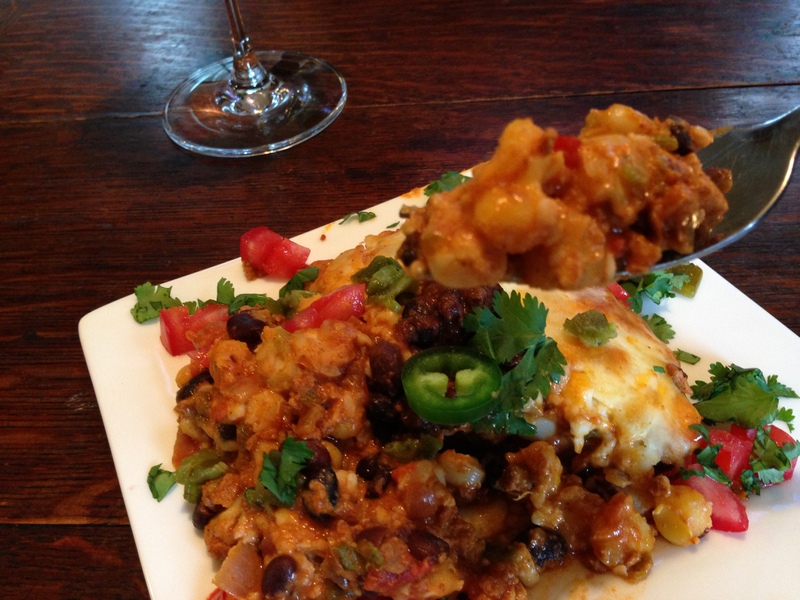 I really am kind of crazy for hominy & I hope you will give one of my hominy recipes a try! 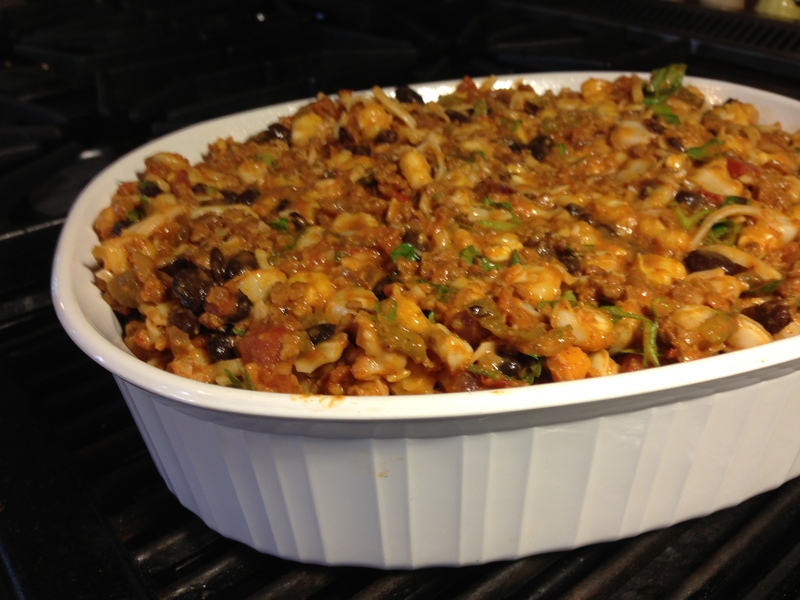 Also – I added up the approximate calorie count of this entire casserole using Soyrizo (which could feed 6-8 pretty easily) and it came to about 3200 calories. 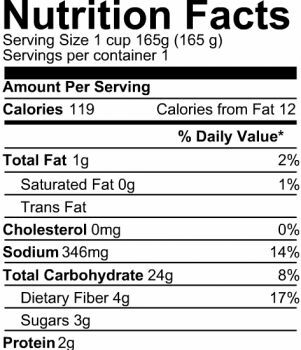 That is 400-550 calories a serving. Even with ALL that cheese!!! It would be higher with chorizo, though. But still – that is pretty low for a meal that feels so rich. 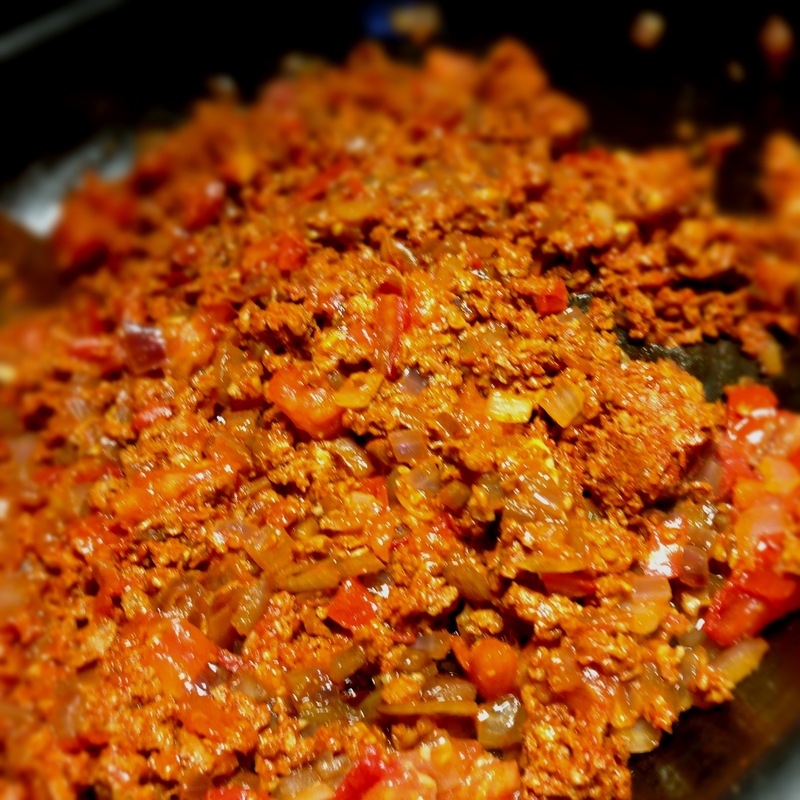 If you are using chorizo – fry it up in a pan until it is cooked through. Try to drain the extra grease & set it aside. 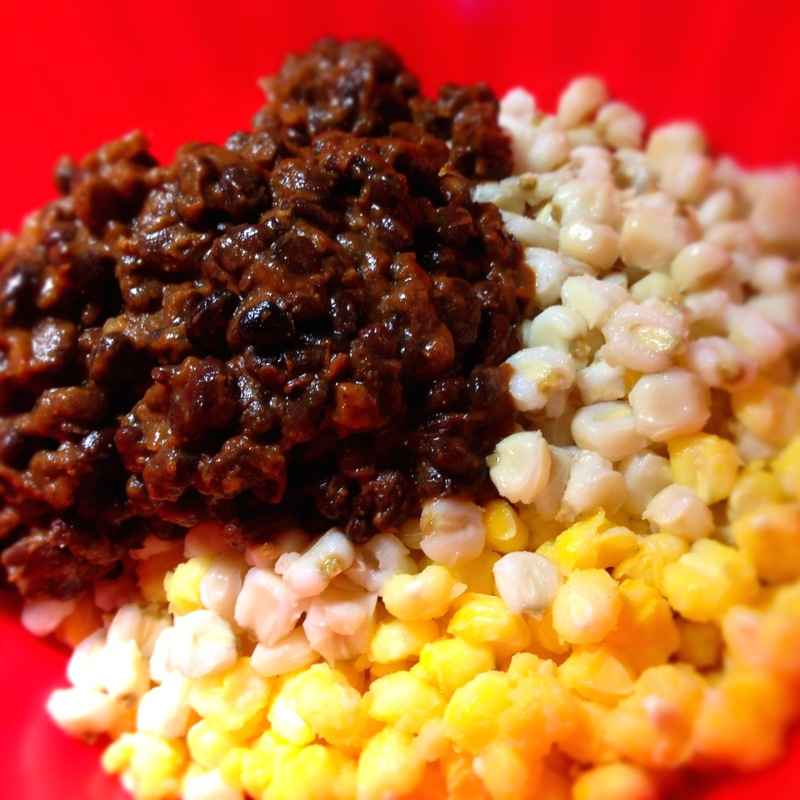 If using soyrizo – no extra step required. 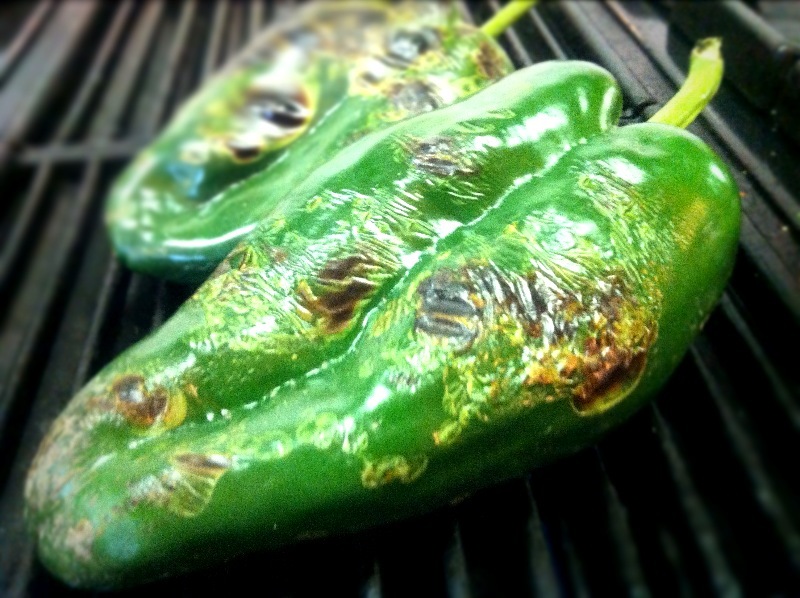 On your stove top, char the outside of the jalapenos until they blacken. 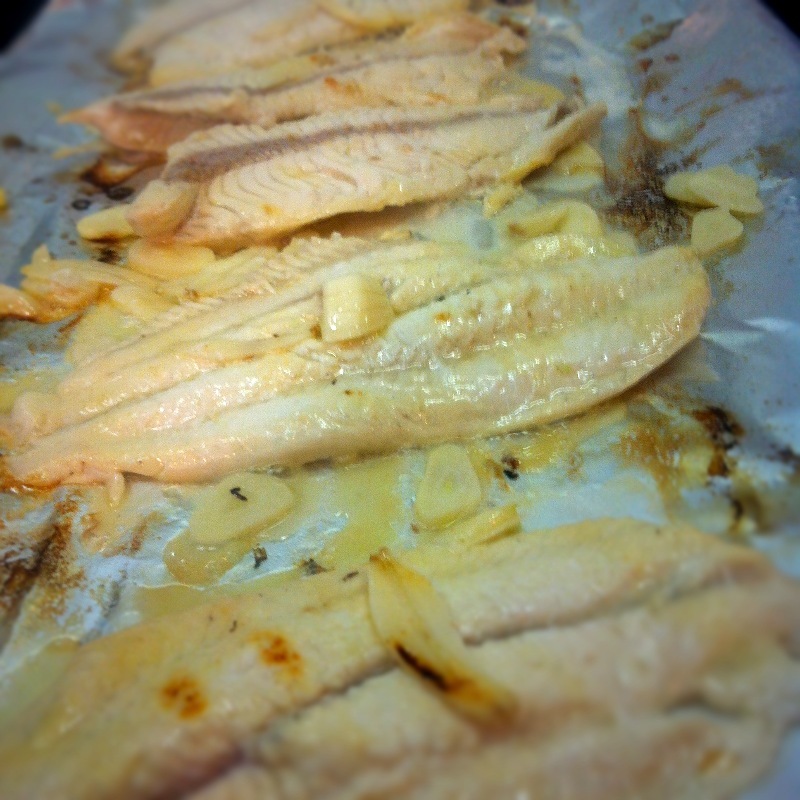 You can do this directly on the burners or by broiling in the oven. Once blackened, seal them in Tupperware or wrap them in foil for about 15 minutes. This will sweat the skin off. Then, under cool running water, roll the blackened skin away & squeeze off the tops & remove the seeds. 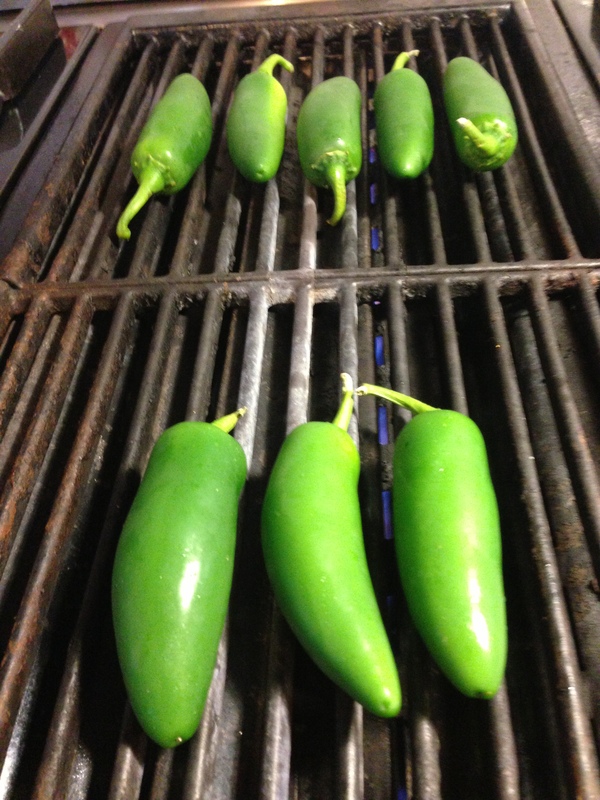 Then – chop the jalapenos finely. 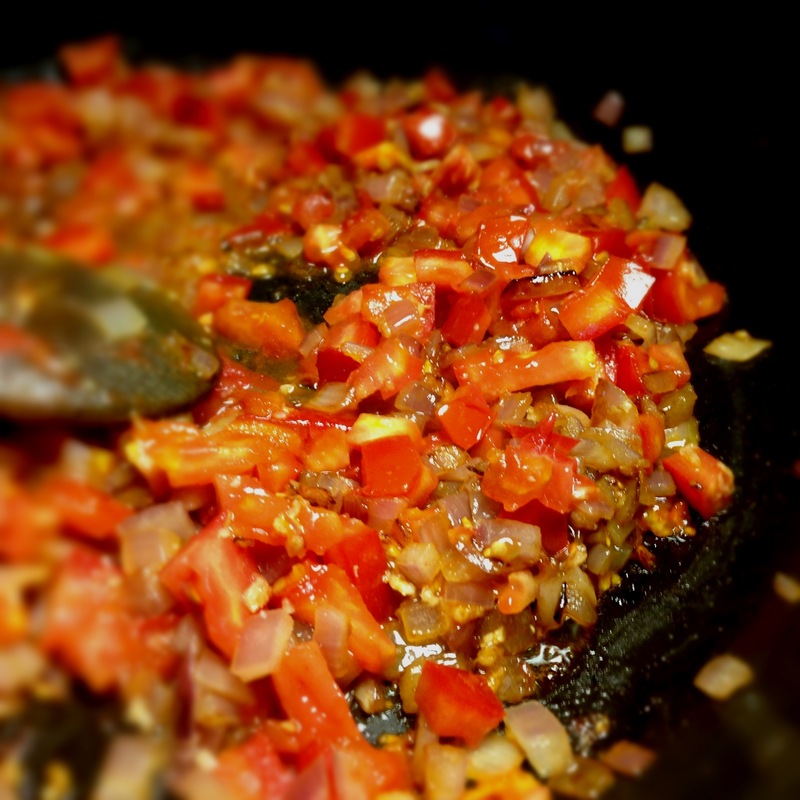 Heat the oil in a large saute pan. 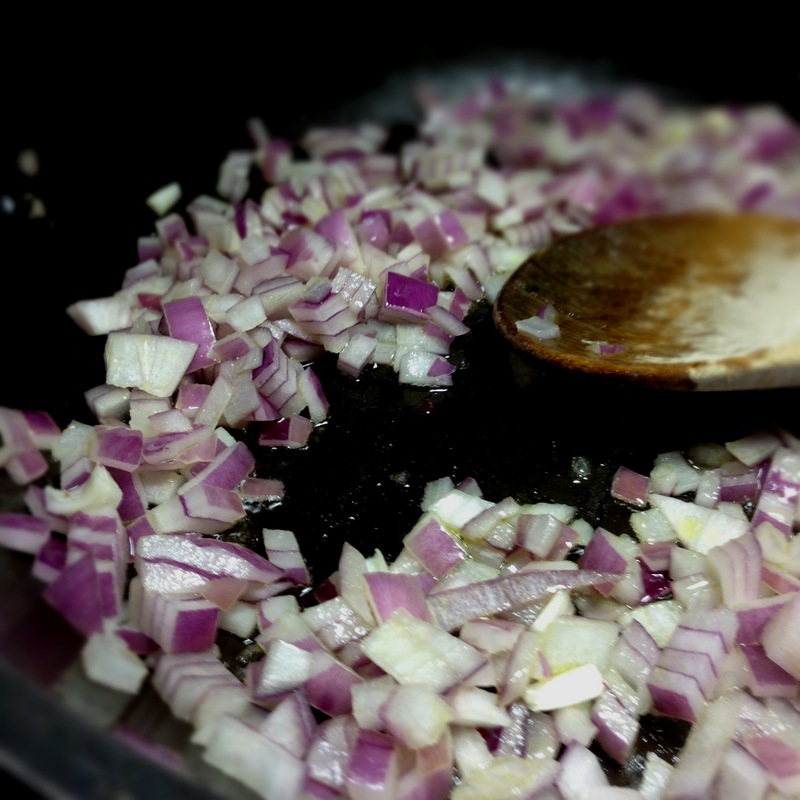 Add the diced onion & minced garlic & saute a minute or two – or until the onion is soft. 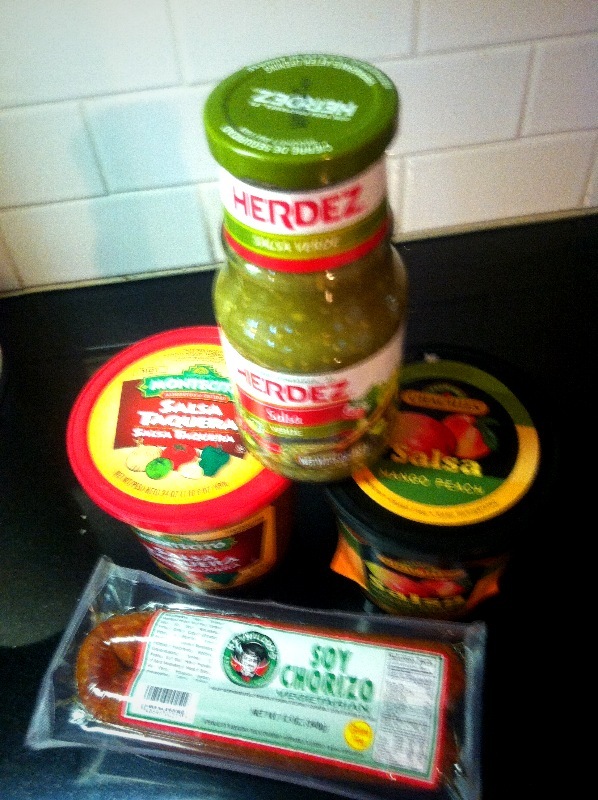 Add the tomatoes, jalapenos & soyrizo (or chorizo). Add the beans (and cumin & chili powder & salt, if using). Stir. Remove from heat. In a large bowl, mix the hominy with the soyrizo/chorizo & bean mix & the milk, sour cream, cilantro and about 2/3 of the cheese. 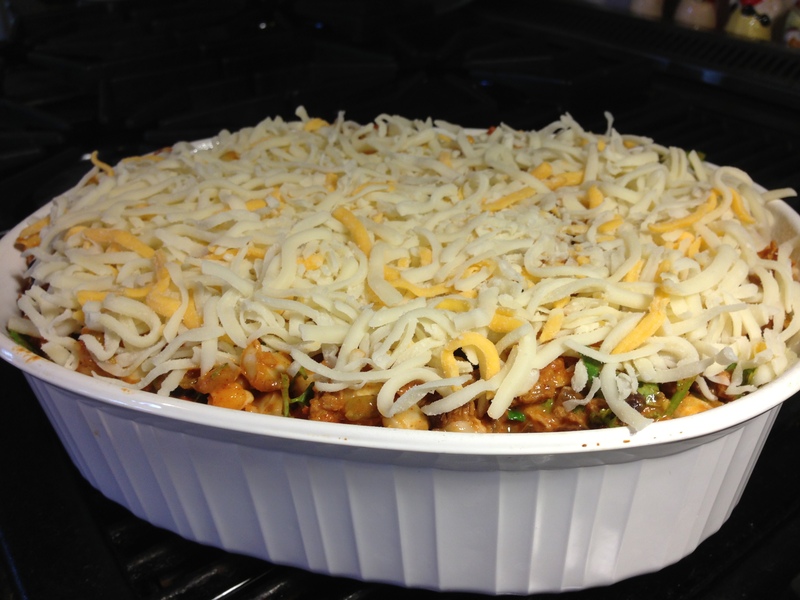 Grease a large casserole pan or other baking pan & pour the hominy mix in. Top with the remaining cheese. Bake for about 30 minutes then increase the temperature to 450 & bake about 20 minutes longer or until the cheese on top is very melted & beginning to turn golden. Let it rest about 15 minutes before serving. 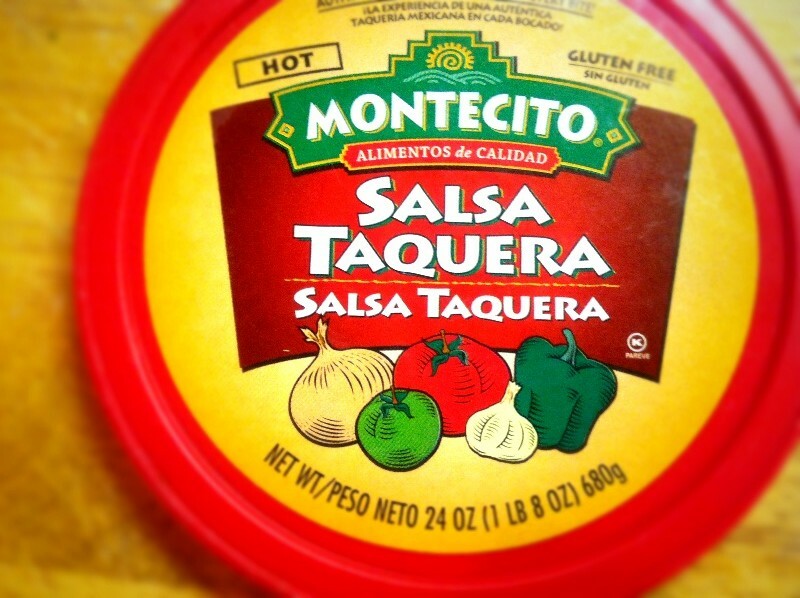 Garnish with extra cheese and cilantro or chopped tomatoes & jalapeno. 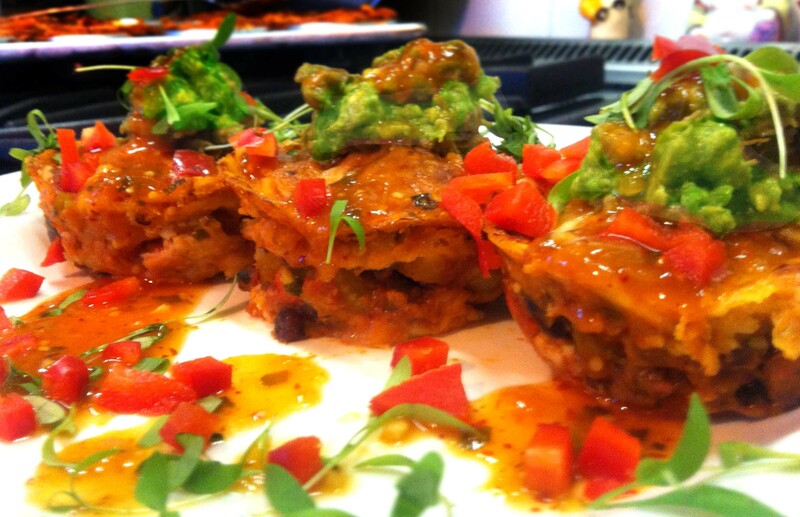 So – I really enjoyed the results I got from the lasagna cupcakes – and thought, “Why not try other savory cupcakes?” There really is no end to what you can prepare in the cupcake pan. 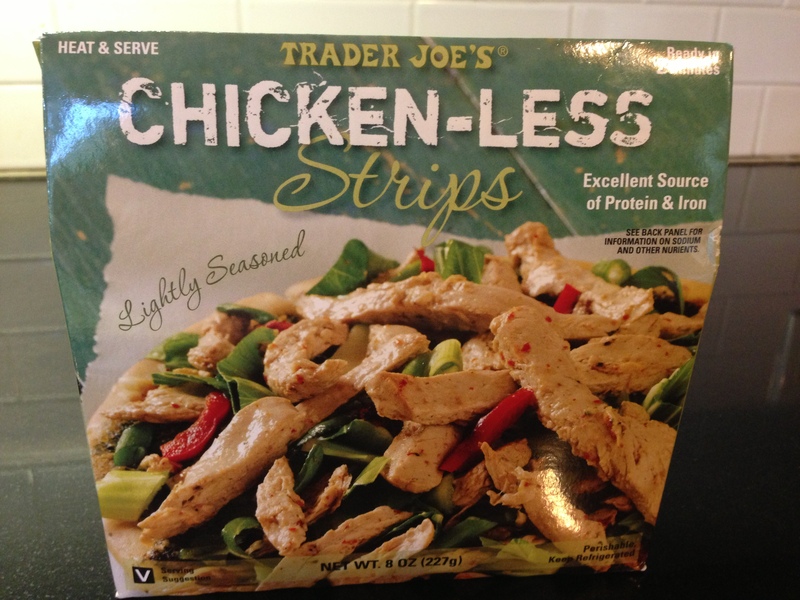 And what a great way to make lots of little freezable, single-serving sized portions! 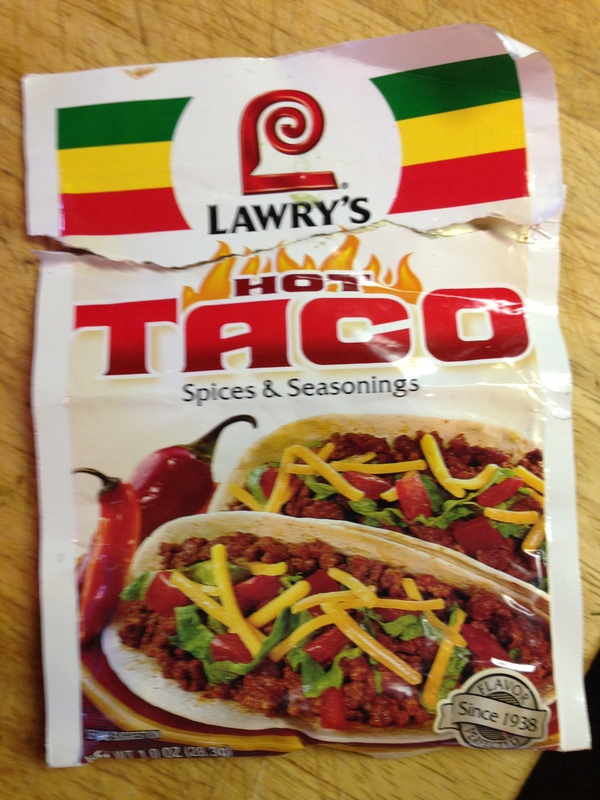 So – since I had taco fixings on hand – I thought I’d experiment there. 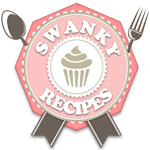 Here are the four versions that I made but do not feel you need to follow these very loose recipes much at all. It’s kinda like a Color Me Mine kitchen project where you can put anything into these taco cupcakes that suits your fancy. 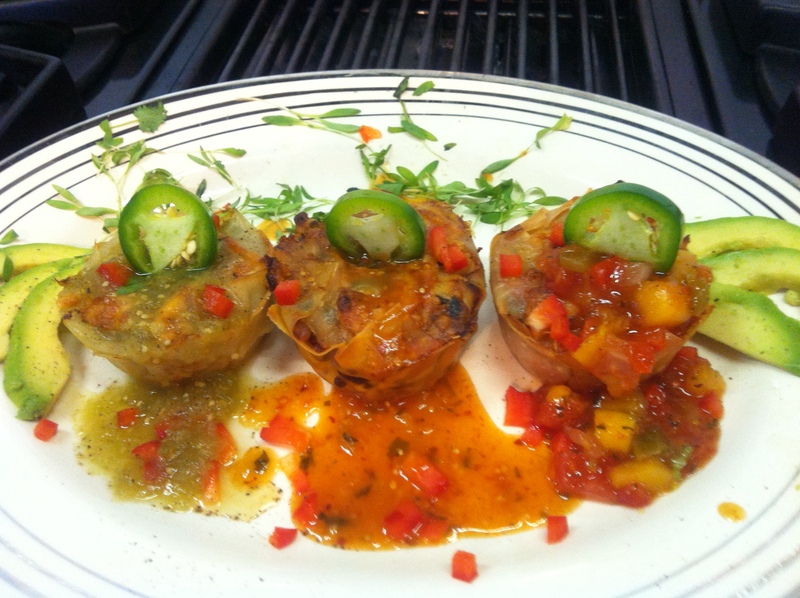 I made three different kinds using wontons (as I did with the lasagna cupcakes) and then one version using corn tortillas. The tortilla version came out a tad more rustic in appearance because I used tortillas cut round with a cookie cutter & therefore they had no outer shell to hold them together. 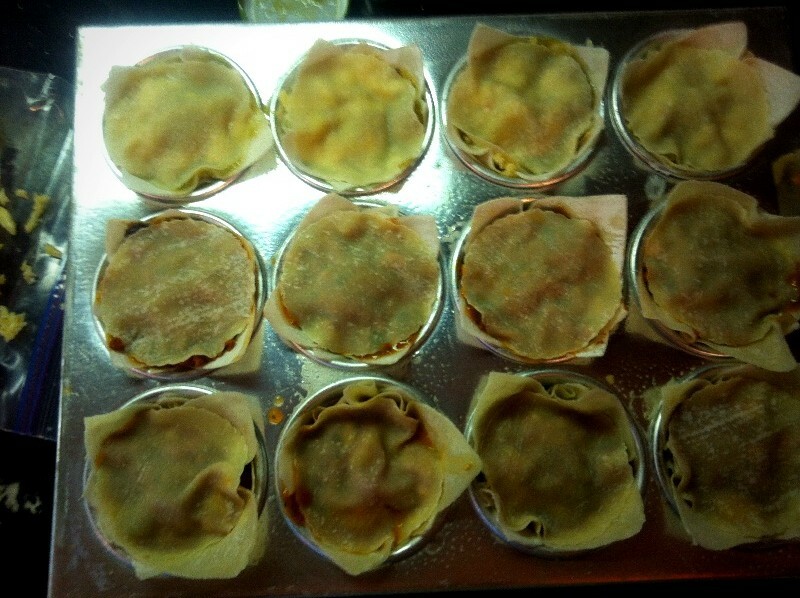 The others came out a bit more elegantly – exactly as the lasagna versions had. 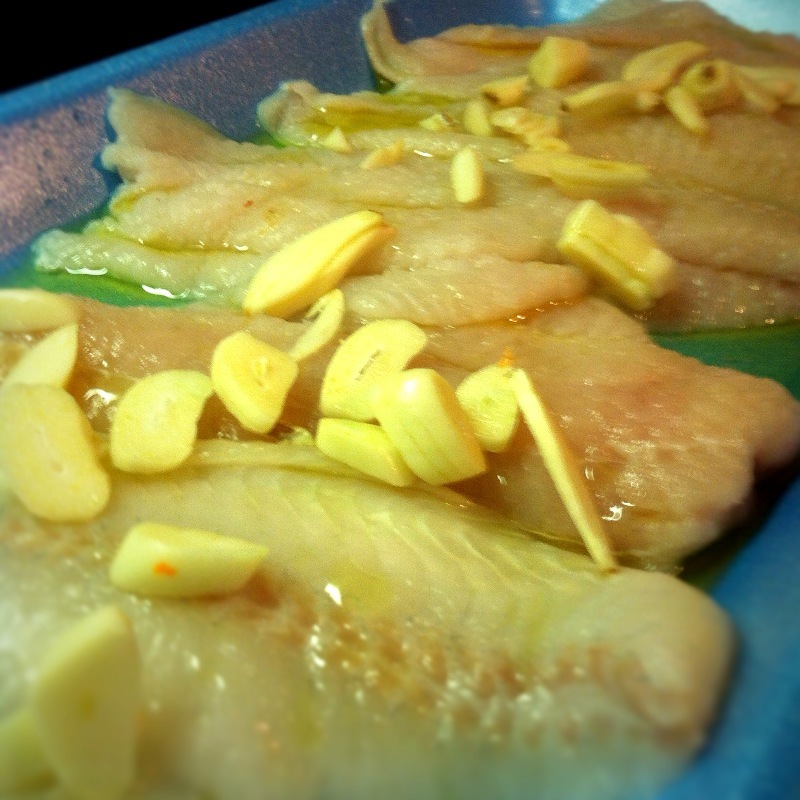 Marinate your fish (or half your fish) in this for an hour or more. 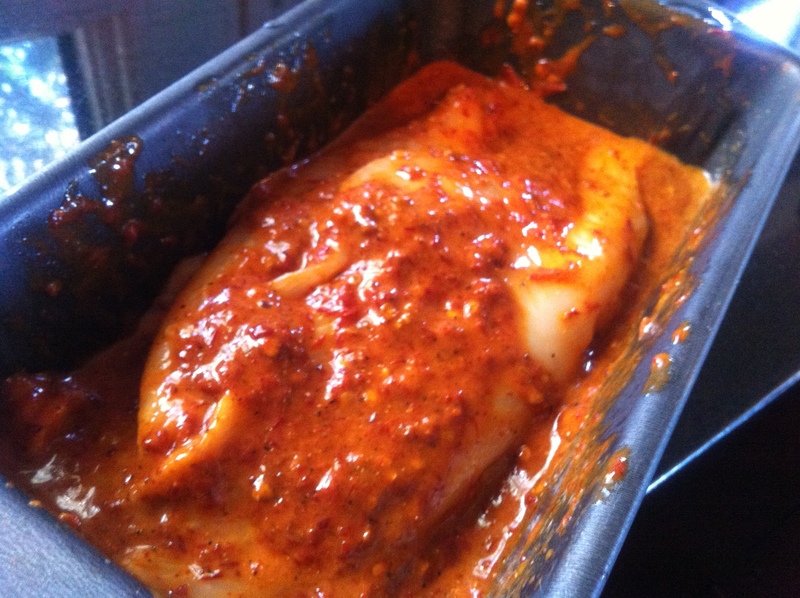 Place your fish (or half if you are doing a chipotle version, too) in a single layer in a marinating dish. Squeeze the juice of two limes over it & add a lot of sliced garlic. I used about 6 cloves. You can go lighter or heavier. 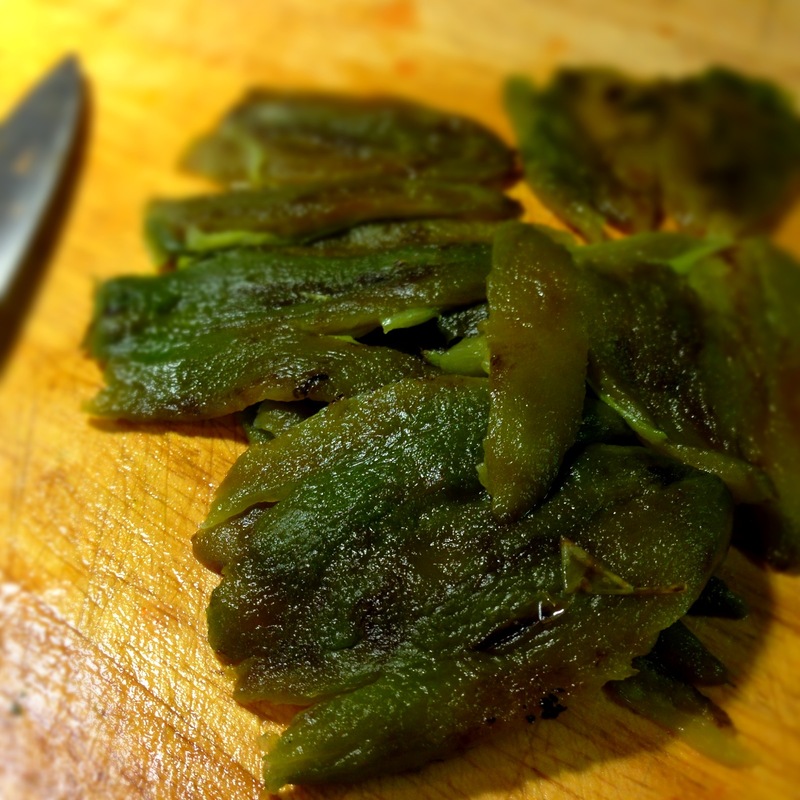 Sprinle with a little S&P – toss a bit & let marinate for about an hour. 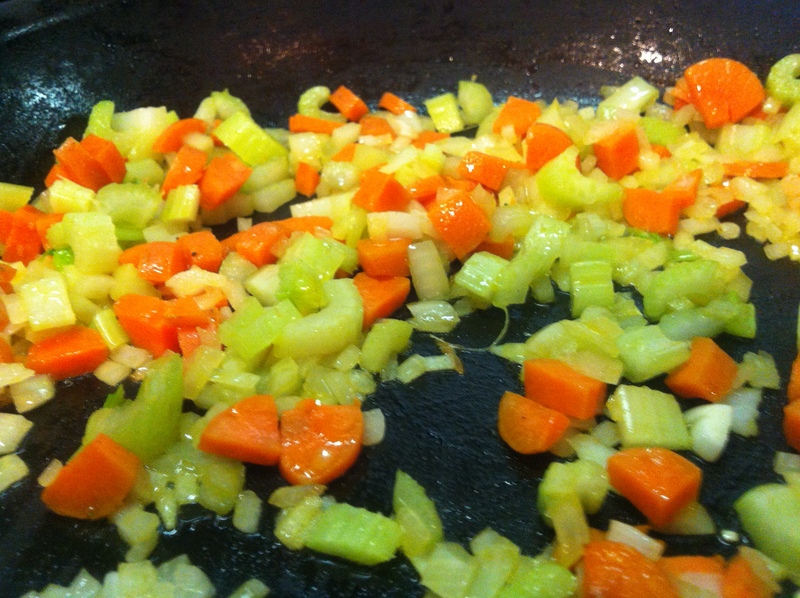 In 1 TBS olive oil, saute the onion, carrot & celery until they begin to soften. 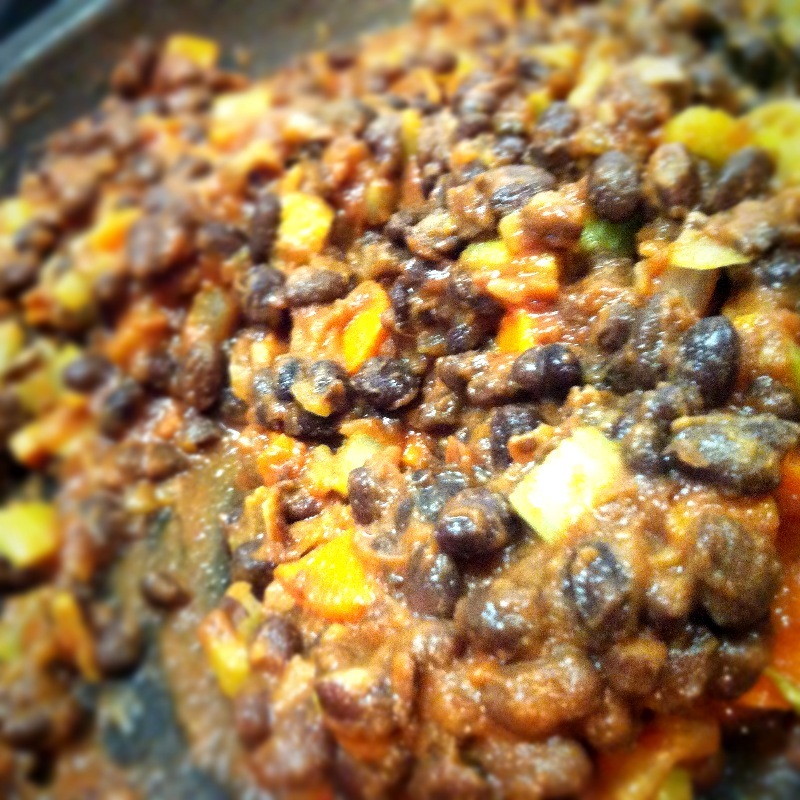 Add the can of drained black beans, cumin & tomato paste. Stir around for about 5-10 minutes. 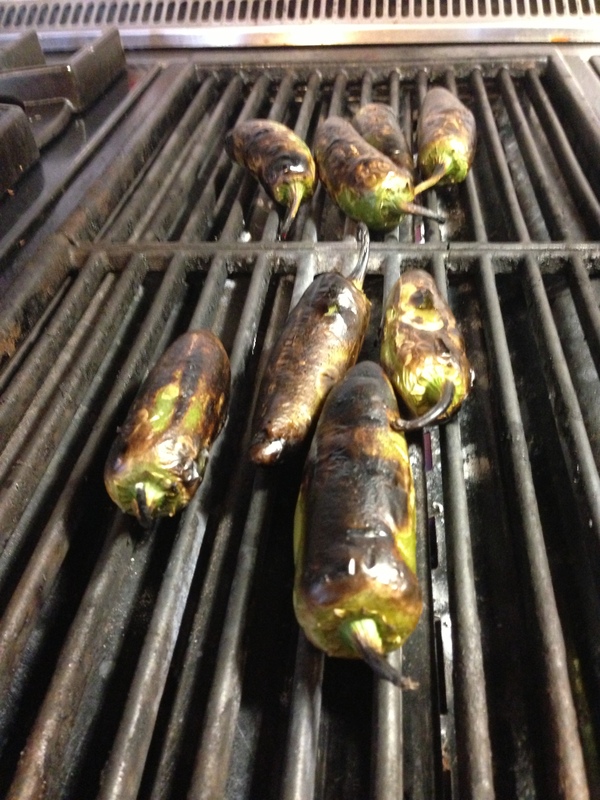 Remove them from heat & set aside. 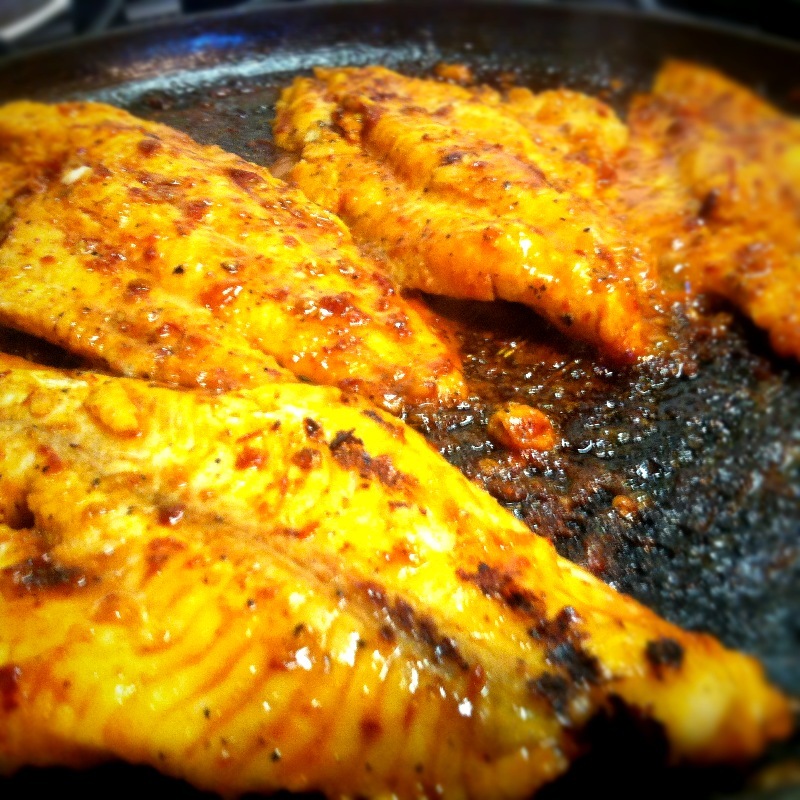 Remove from marinade & cook either on a grill or in a grill pan or frying pan sprayed with a nonstick spray – keeping the two flavors (Chipotle & the Garlic-Lime) separate. 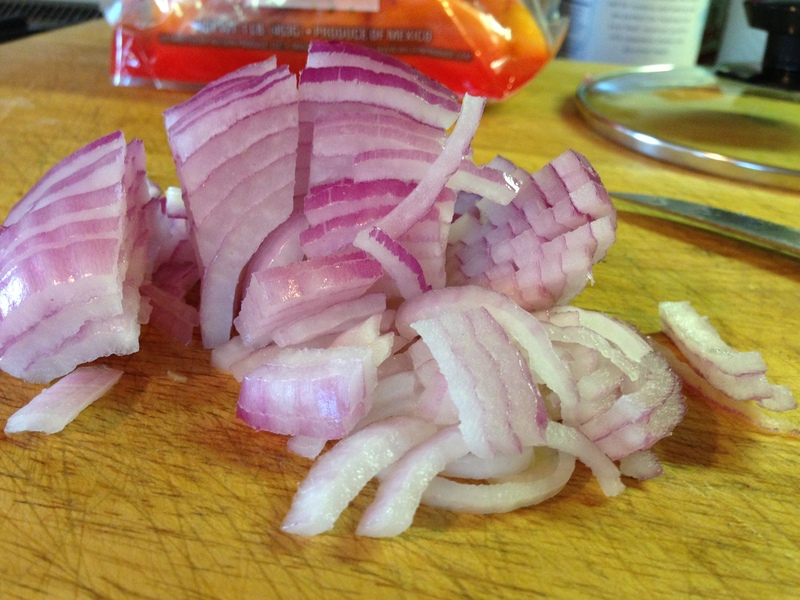 Once cooked through – break up into smaller pieces. Set aside. Spray your cupcake pan with nonstick spray. 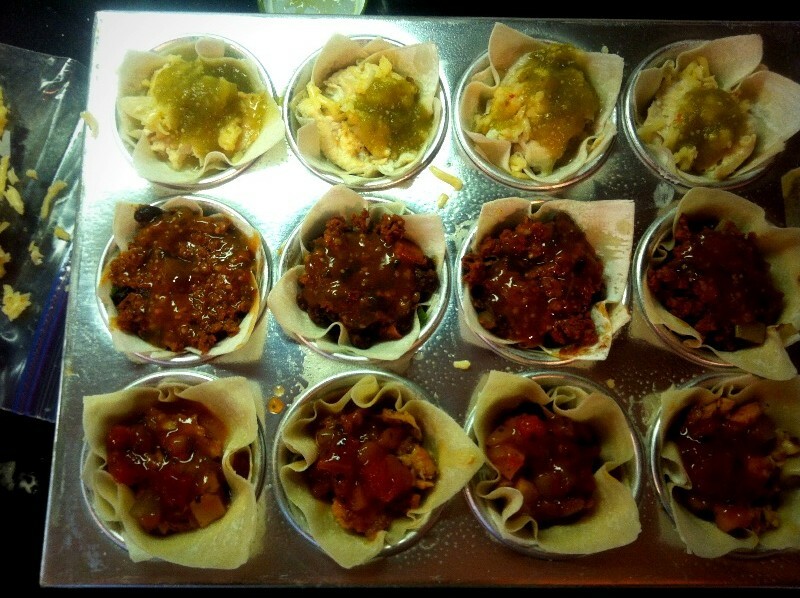 Line each cup with a square wonton or with a corn tortilla cut to the size of the cupcake hole – either with a cookie cutter or the rim of a glass. I used a cookie cutter & used a smaller circle for the first two layers then the larger one for the top layer in both the tortilla version & cut only the top layer in the wonton version. 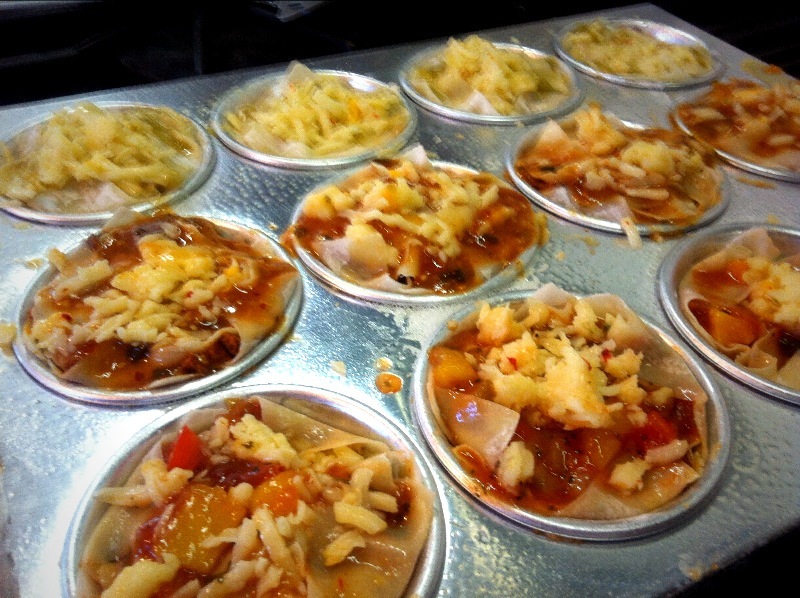 So – in each cupcake tin – layer a small amount of the ingredients you selected (or other variation). Then add another square wonton or round corn tortilla. Another layer of ingredients and then top with a large rounded wonton wrapper or a larger corn tortilla disc. Top everything with a little more salsa & top all of them with pepper jack cheese. 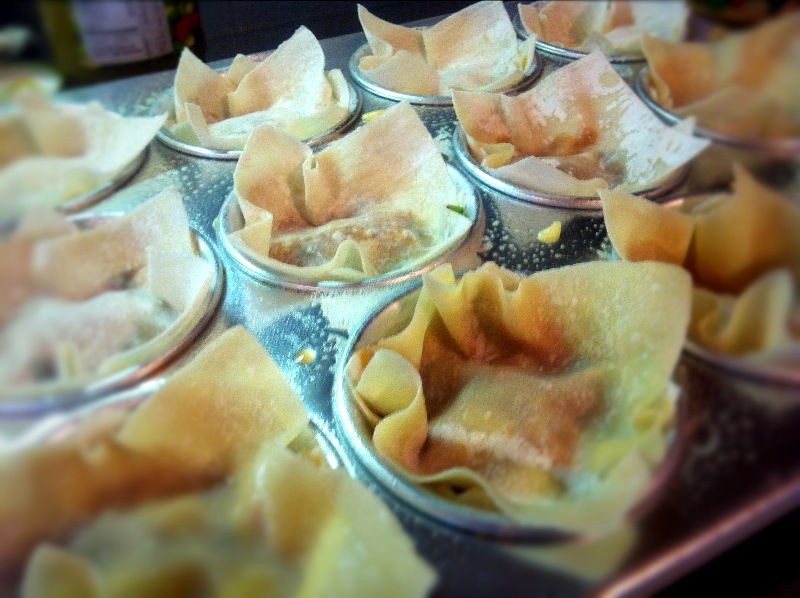 In the case of the wonton versions – press the protruding wonton corners down into the topping so they look like little flat bundles. 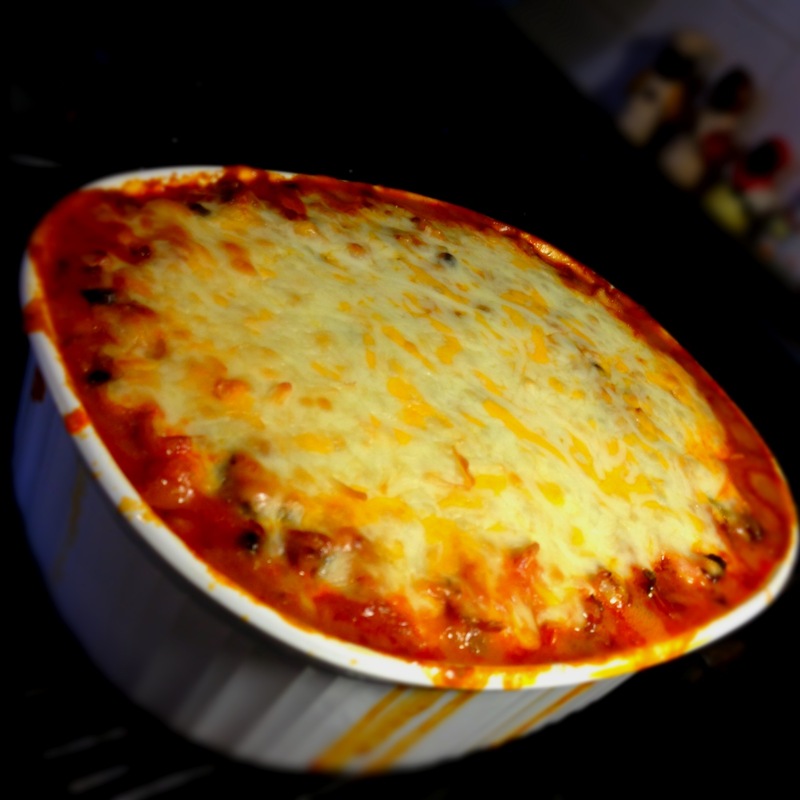 Cook in the oven for 18-25 minutes – checking frequently to be sure they do not burn. 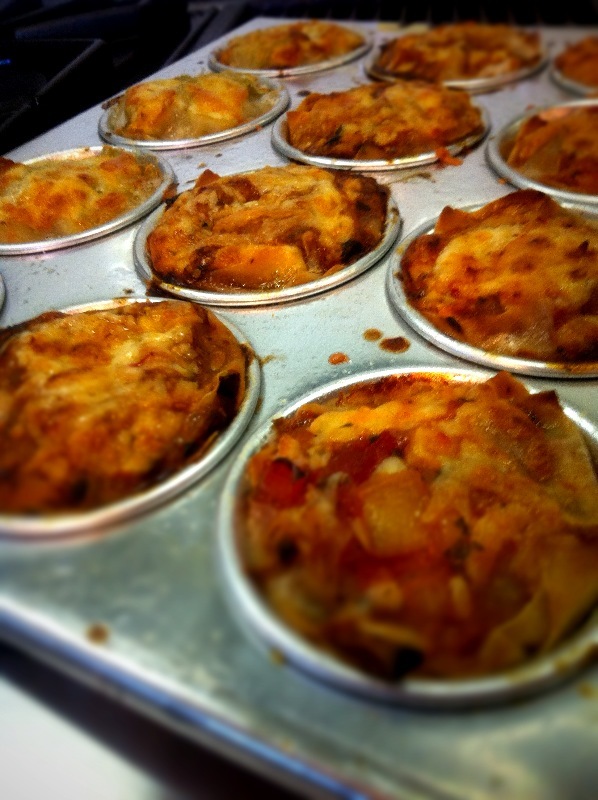 Remove from the oven & let cool for at least 5 minutes before trying to remove them from the pan. The corn tortilla ones will naturally be harder to get out of the pan. Maybe use a large serving spoon to assist in the lifting. Top with either: sliced avocado or guacamole or more salsa or cilantro or more cheese or jalapeno peppers – whatever sounds good to you. Remove the skin & pit from the avocado. Retain the pit. In a bowl – chop the avocado very fine. Squeeze a little lime juice in there & add a little salt. Mix it up until it become creamy but some small chunks of avocado remain. Taste. Add more salt or lime to taste. 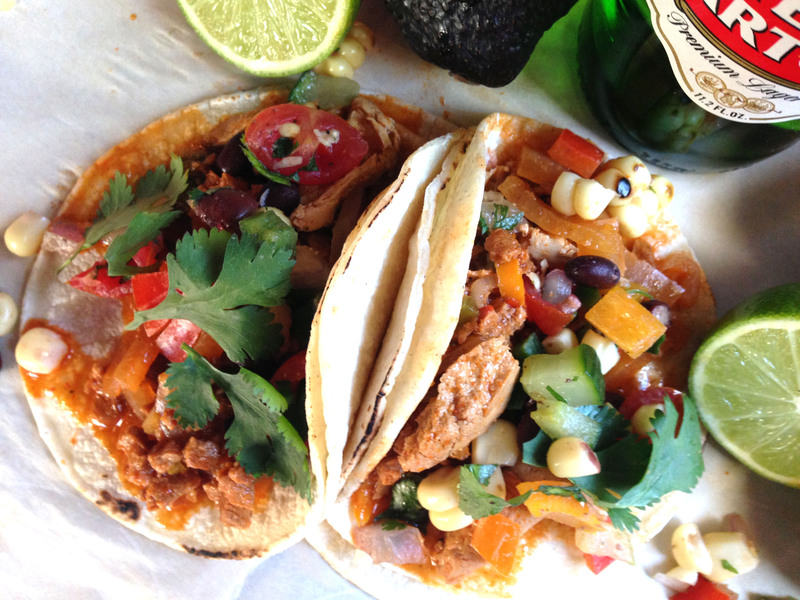 Once it tastes good to you – put the pit back into the guacamole. It will keep it from turning brown.